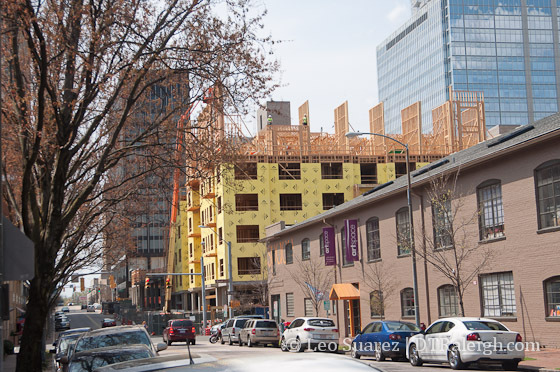 Vicissitudes of the Oak City is a series taking a look at past development plans in downtown Raleigh that left behind details we can still see today. The things we plan don’t always turn out the way we thought they would and each story results from some external factor that changed things for the better or worse. This is the first in a new series I’m creating called Vicissitudes of the Oak City. 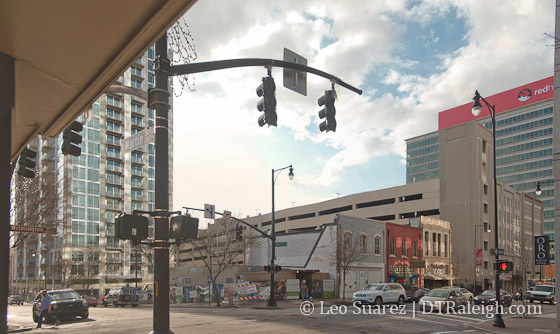 Rather than a traditional history lesson, I want to write about past plans for downtown Raleigh that faced a sudden change, for the positive or negative. What I enjoy about these is that we can see evidence of the changes all around us yet we may never even notice them. For the inaugural post, I want to highlight a detail that we can see on The Edison block, something I’ve been staring at for years. The development of what has been called The Edison has been going back for almost ten years now. 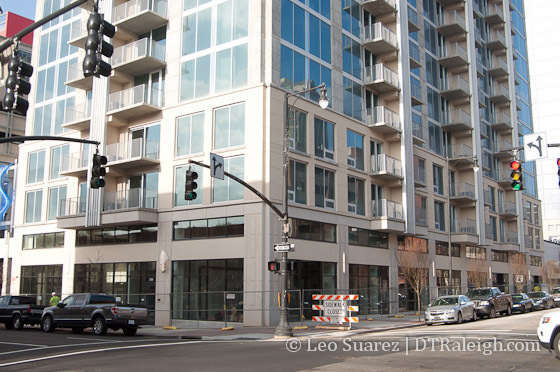 This block, currently consisting of the Skyhouse Apartments and Edison Lofts, had plans for much larger and grander buildings but the great recession of 2008 changed everything. With permission, I’m posting a rendering of The Edison as it was seen through the eyes of 2007. 2007 Rendering of The Edison, Raleigh NC. JDavis Architects. Click for larger. While talks of The Edison were taking place, a nearby tower was close to opening. The RBC Plaza, now PNC Plaza, opened in 2008 and the Blount Street parking deck, located on The Edison block, was used as additional parking for the office space in PNC. 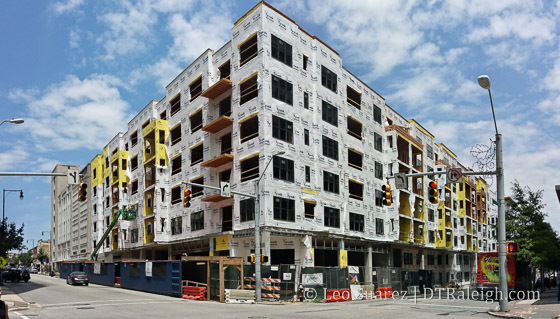 If you stare up at the parking deck, the stairwells along Wilmington and Blount Street contain an extra floor. You can see it on the Blount Street side, photo above, and the Wilmington Street side, photo below. The stairwells were built that way for a rooftop park that was never built. As part of the original Edison plans, an “amenity level” was planned for the top of the parking deck allowing patrons from the towers as well as the public to use the open space. You can see it in this zoomed in, annotated portion of the original Edison rendering. As mentioned earlier, the great recession changed everything and housing as it is today is not the same as it was before then. 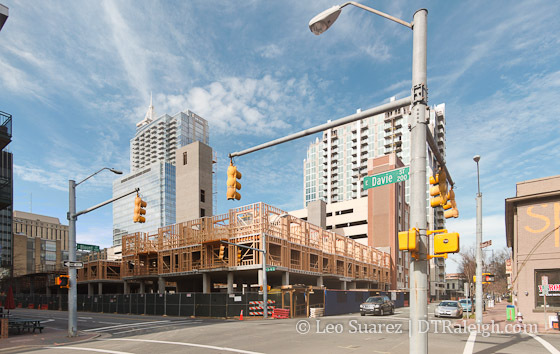 This lead the team behind it, as well as all other downtown Raleigh projects, to rethink development. Could a rooftop park ever be built on top of that parking deck one day? I don’t see why not but there are no plans for that at this time. I can’t help but think that the deck has potential, sitting there in some unfinished state. Economics may never get us there and with a nearby Dix park planned, green space is probably not hurting for downtown. I still can’t help but get lost in thinking about something so unique for downtown Raleigh like a rooftop park with skyscraper glass views in almost all directions. 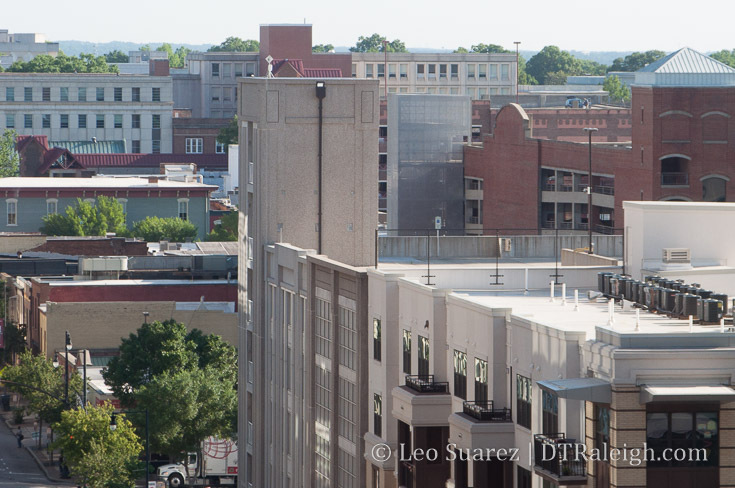 While the Blount Street Parking deck is still accessible to the public today* (7am-7pm) I encourage anyone to take the elevator to the top floor and imagine stepping out to trees, gardens, and people rather than sleeping vehicles baking in the sun. *According to current plans, once The Edison office tower is open (no outlook at this time), planned for the corner of Wilmington and Martin Streets, the public parking spaces will be allocated to support that tower and the deck will be for private use 24/7. Demolition is taking place at the corner of Wilmington and Martin Streets, the former site of the future Edison Office tower. I say “former” tower because earlier this year, Highwoods Properties has acquired the parcel from the past developer. No plans are public yet for what the new owners might do with it. 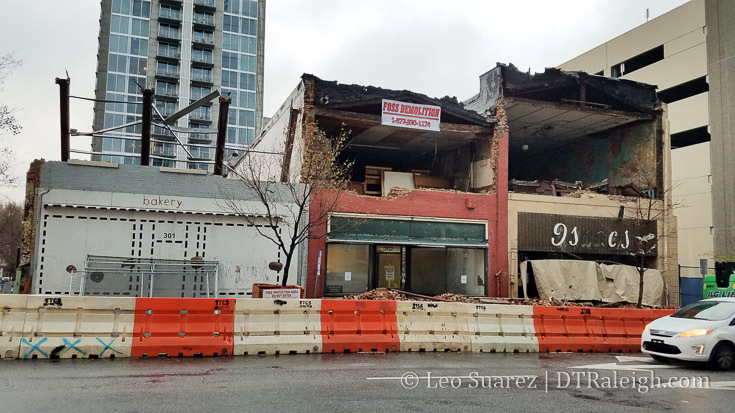 When I took this photo on Tuesday of this week, it looked like some asbestos was being removed from the center building in the photo, where Reliable Loan was originally located. If full demolition is planned, I imagine in a few days these old Raleigh buildings will be gone. The view of The Edison Apartments at the corner of Wilmington and Davie Streets. Here’s the same view almost a year ago. The building is topped out and it looks like residents might be moving in around the end of the year. 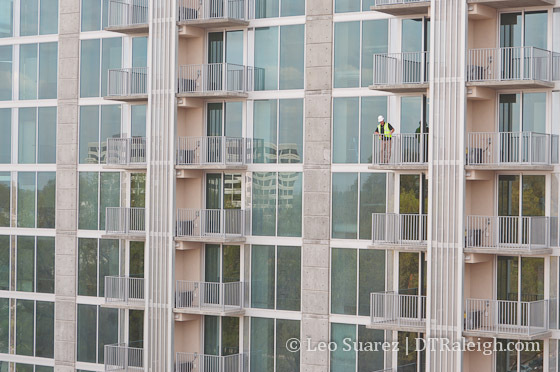 A worker looks out over a balcony at Skyhouse Raleigh. 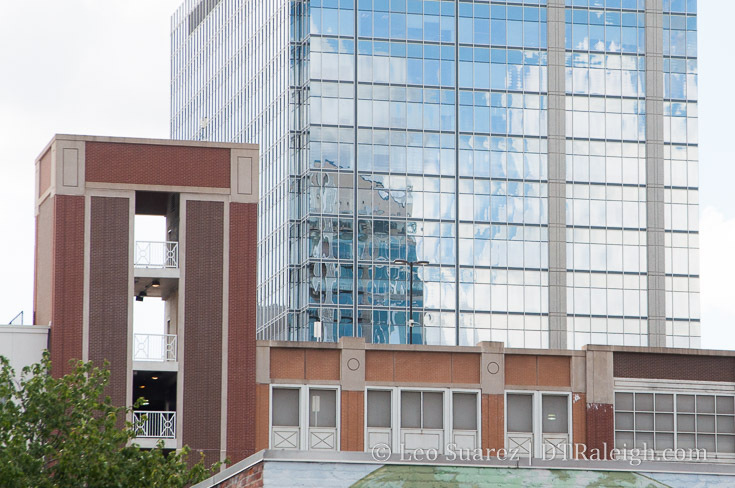 The flowers and leaves aren’t the only things that are growing in downtown Raleigh. I took a walk around the Edison block and snapped a few photos of the new and upcoming developments here. 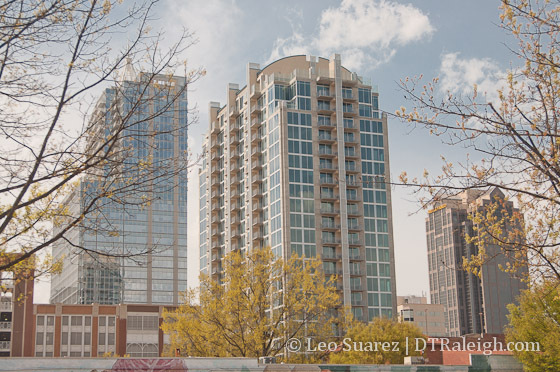 These include the apartment buildings of Skyhouse Raleigh, the Edison Apartments, and the Edison Office tower. All being delivered by the same developer, when open these projects will add a serious injection of new residents and office space to the downtown core. It’s possible that the bump in residents might trigger more retail or counter-service food places. Nearby Sosta Cafe has already posted that they will experiment with longer hours, including staying open on weekends because of the Edison Apartments right across the street. Maybe more will follow. 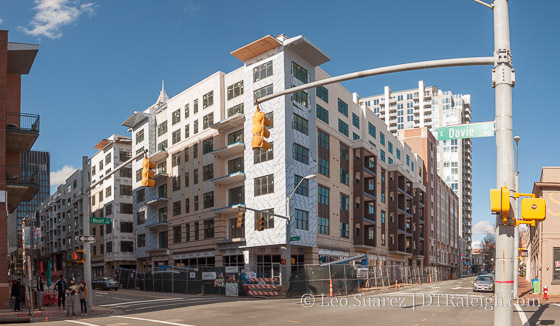 Skyhouse retail spaces at the corner of Blount and Martin Streets. 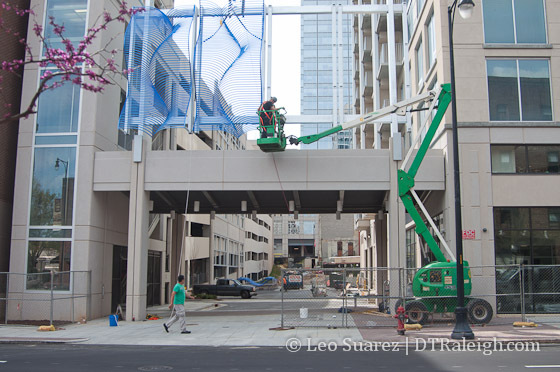 Artwork being installed over the vehicle entrance along Blount Street. 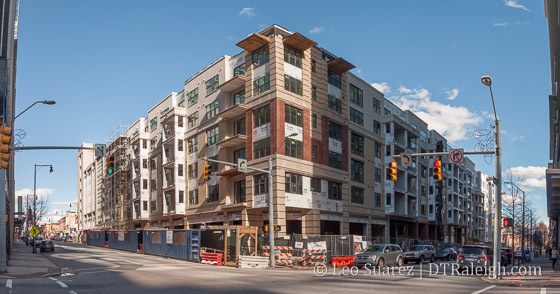 The construction of the Edison Apartments is humming. The Blount and Davie corner is much farther along compared to Davie and Wilmington. Unlike Skyhouse, this building goes right up against the parking deck. That means even more space for retail along all the sides of Blount, Davie, and Wilmington. 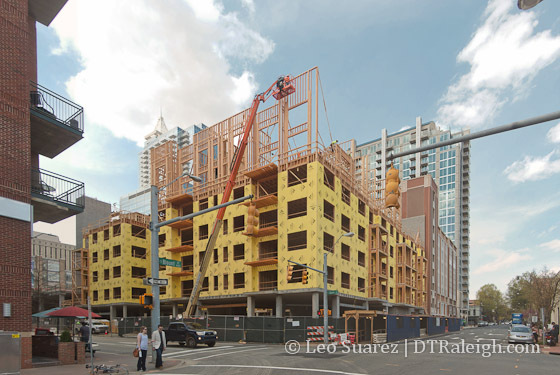 Construction of the Edison Apartments as seen from Davie Street. Corner of Davie and Blount Streets. Corner of Davie and Wilmington Streets. 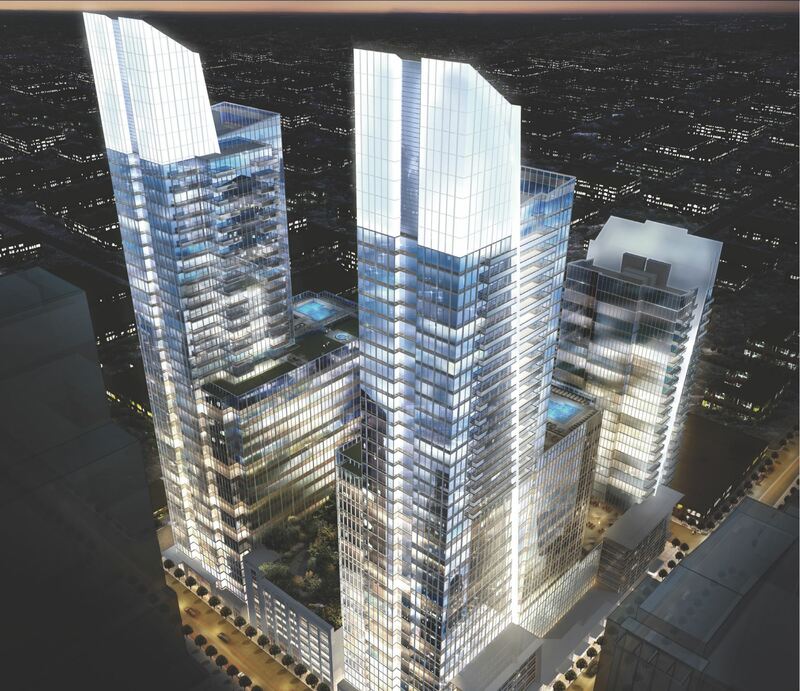 Edison Office will be a 19 story office building with 14,350 square feet of retail and 245,895 square feet of office in downtown Raleigh, NC. Let’s hope for an increase in office pre-leases as that will help bring this tower into downtown finally. Corner of Martin and Wilmington Streets. The Edison Apartments at the corner of Blount Street and Davie Street. Saw this on Twitter. This project is increasing in height it looks like. Corner of Wilmington and Davie Streets, future site of The Edison Apartments. The two-story brick buildings have been removed and the site is cleared for new construction. Here’s a photo of the same corner in 2008.